We are a Church that believes in the Power and the Presence of God. We are located in the beautiful city of Springfield, MO. 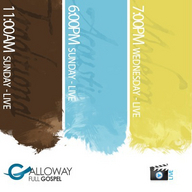 The services at Galloway are blessed with a powerful mixture of preaching, teaching, and Spirit led worship!